Check out our happy dancing bears! No, they haven’t had too much champagne, Anna-Louise Bouvier and Sharon Richens were just super excited to collect three award trophies for Happy People at this year’s LearnX Impact Awards. Happy People won the awards for our highly successful roll out to 1500 Optus Retail staff. Sharon and Anna-Louise attended the awards show on the 6th September at the Sofitel in Sydney. Now in its tenth year, the LearnX Impact Awards aims to identify and celebrate exceptional accomplishments in learning and development. The HBAW team are still on cloud nine after HAPPY PEOPLE claimed the top award for Best Website & Online Service - Health & Wellbeing, for our work with Optus Retail at this year’s Amy Digital Awards. The winners were announced at the Digirati Awards Party in Melbourne on Friday 7 July. Taking to the stage to collect the award were HBAW’s Sharon Richens and Julie Taliana. They were joined by Optus’ Head of Branded Retail, Ben Murray, and Wellbeing Manager, Megan Kingham who were both instrumental to the success of the roll out to 1500 Optus Retail staff. This year AMIA received hundreds of entries in 40 categories which were judged by over 130 judges locally and internationally. A total of 37 Amy awards and 18 highly commended trophies were given out on the night. The Amy Awards are the most prestigious digital industry awards in Australia. Now in its 23rd year, the AMY's celebrate the digital industry and reward the best and most brilliant work. The Amy Award takes Happy People’s 2017 award tally to four, after being awarded three LearnX Platinum awards earlier this year. Nurses and midwives work around the clock to care for our loved ones, and helping them to support their own health and wellbeing is of utmost importance. Which is why we’re so excited to be rolling out HAPPY PEOPLE to 2,500 nurses and midwives throughout Victoria. The Happy People pilot was officially launched by the Minister for Mental Health, the Hon Martin Foley MP at the Women’s Hospital last month. Head of ABC Commercial, Robert Patterson, also attended the launch. More than 2,500 Victorian nurses and midwives were invited to take part in the Happy People wellbeing program aimed at helping them to manage their sleep, improve their moods and maintain their energy levels. And what an incredible group of professionals they are! Happy People is a team based experience that encourages some friendly competition to encourage engagement. With team names such as ICU Smile, We Be Lung Together, and X-Rays of Sunshine, it’s wonderful to see the nurses and midwives getting onboard with the program in such a positive way. Anna-Louise was honored to be invited to MC at the Corporate EA/PA Summit in Sydney and Melbourne recently. It gave her the opportunity to meet and introduce an incredible group of inspirational women including The Hon Julia Gillard, world champion cyclist Anna Meares, communication guru Amy Scott, and Dr Jenny Brockis. Now in its 13th year, The Corporate PA Summit is Australia and New Zealand’s leading event designed to help PAs and EAs excel by meeting, interacting with, and learning from the best in the business. Need a speaker for your next conference or offsite? 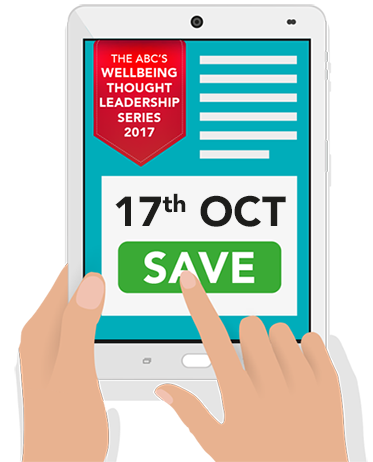 ABC Commercial invite you to Melbourne for a high level HR leadership forum on Tuesday 17th October. We bring together inspirational speakers, industry influencers, and HR experts to examine the latest wellbeing trends and implications for business.